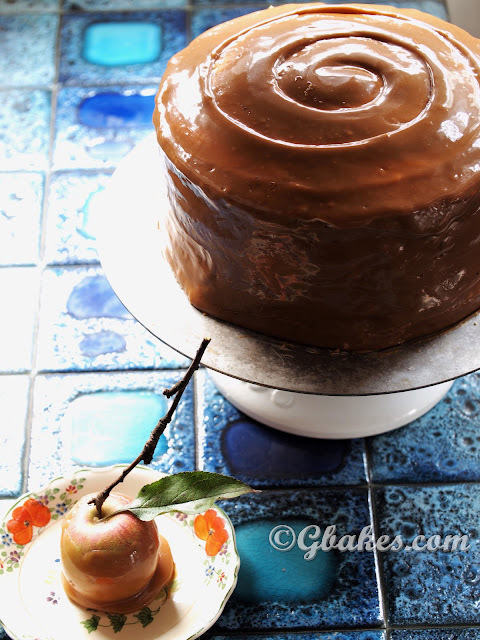 I've dreamt of this recipe, of the textures and the taste. It's a recipe that I've been rearranging in my head, the ratios and ingredients shifting and merging to spawn what I imagine is my perfect donut experience. That I have a soft spot for donuts is not a secret. That I make great donuts is well known. But I've been hankering for a fried gustatorial experience that hasn't yet crossed paths with my fryer or my tastebuds. So this culinary conundrum has pestered me and I've been heeding its call. I've had it in my noggin' that what I've wanted, a donut with volume but not burdened by density, would require a special ingredient. A donut with an open and airy crumb but not vacant of some mouthy chew needed something special. 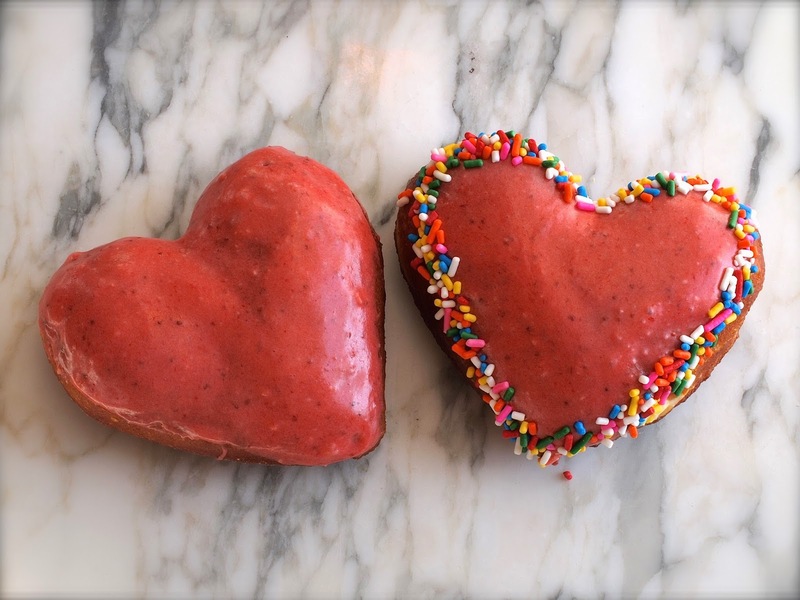 A donut with sparks of brightness and depth needed a hearty partner in crime. And what I kept going back to was "potato." I've had donuts with mashed potato. That slightly stodgy texture isn't for me. But potatoes made sense to me, in the way that dried mashed potato flakes bring sandwich bread straight back to childhood. It's this interplay of defined texture that simultaneously steers clear of dense and airy; it lives somewhere in the heavenly center. I think I got there. 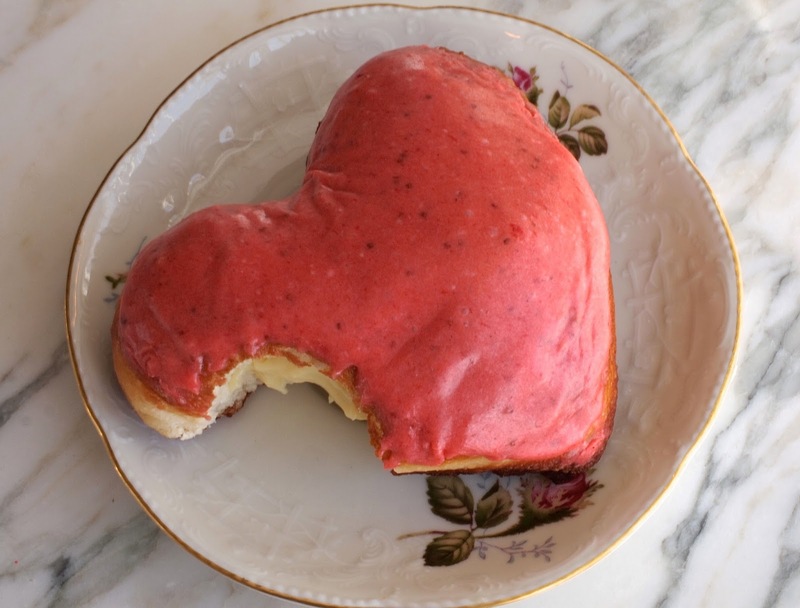 Just in time for St. Valentine to eat his heart out. 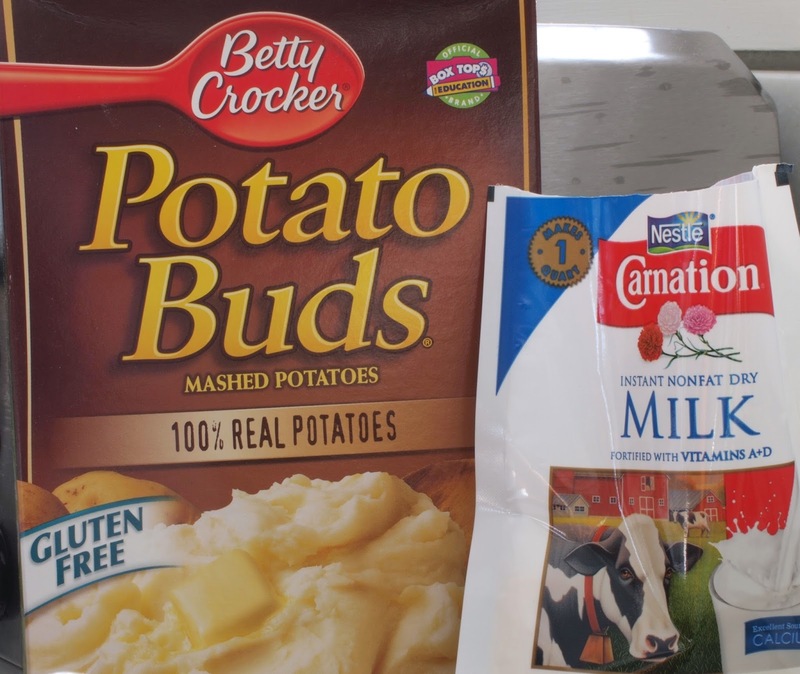 In a large mixing bowl, combine the flour, sugar, ground potato flakes, dry milk, yeast, salt and zest. Whisk for 30 seconds to distribute the ingredients. Set aside. 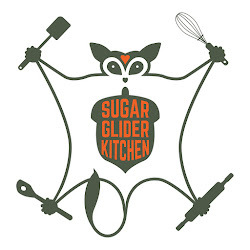 In the bowl of a stand mixer fitted with the dough hook, combine the water, eggs and vanilla. Whisk to break up the eggs and then add the shortening. Add all the flour mixture and mix on low speed for 10-15 minutes or until the dough comes away from the sides of the bowl and is very smooth. It should be slightly tacky but not wet and sticky. If you feel it's too wet, add a tablespoon at a time of flour until you've reached the desired texture. Transfer the dough to a bowl coated with oil and turn the dough over a few times in the bowl to coat the dough with oil. Cover with plastic wrap and place in a warm area of your kitchen until doubled in size, 1 - 2 hours. 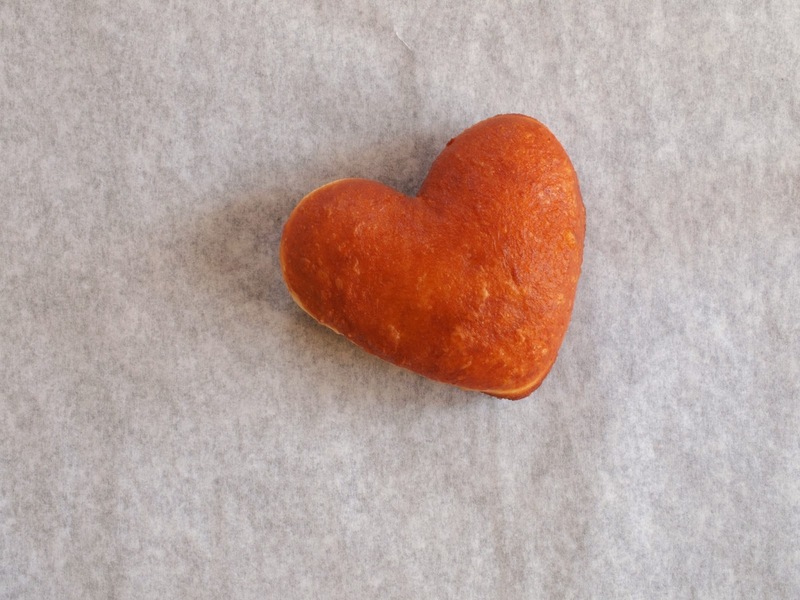 Roll the dough out to 1/2 inch thick and using a sharp heart shaped cutter, cut out the dough and place on a parchment lined sheet pan, a few inches apart. 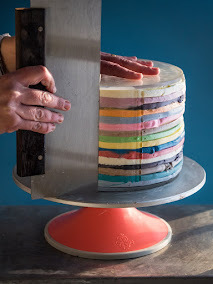 Clean the edges of your cutter every few cuts so the process goes more smoothly. At this point I cover my hearts with plastic wrap and refrigerate overnight. 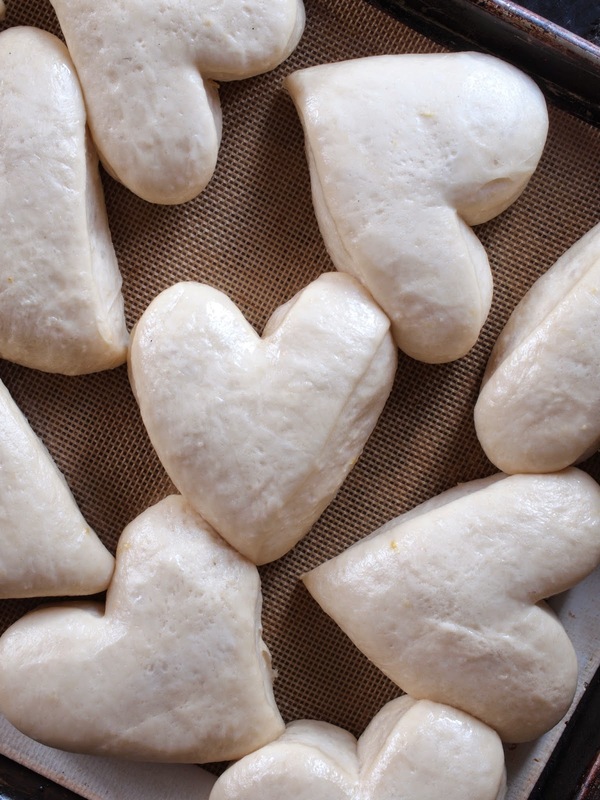 If you'd like to move on with the process instead of fridging overnight, still cover the hearts with plastic wrap but leave them out to proof until puffy and not quite doubled in size (be careful not to over proof) about 30-40 minutes or longer if your kitchen is cold. In a large bowl, combine the sugar, cornstarch, salt, vanilla and egg yolks. Whisk until smooth. In a large saucepan, bring the milk to a simmer and careful pour the hot milk into the sugar/yolk mixture, whisking constantly, until the two are combine and smooth. Return the mixture to the saucepan and whisk constantly over low heat until the mixture thickens to the consistency of mayonnaise. Transfer to a large bowl and cover with plastic wrap, making sure the wrap touches the surface of the cream so a skin doesn't form. Refrigerate until cool, about 45 minutes. In a large saucepan, combine the strawberries, sugar and lemon juice and stir over low heat until the strawberries are soft, the sugar has melted and the entire mixture has thickened, about 20 - 30 minutes. Transfer the mixture to a blender or food processor and puree until smooth. Refrigerate until cool, still in the blender or food processor container, about 20 minutes. Add the confectioner's sugar and butter and blend until smooth. Transfer the mixture to a shallow bowl and cover until needed. 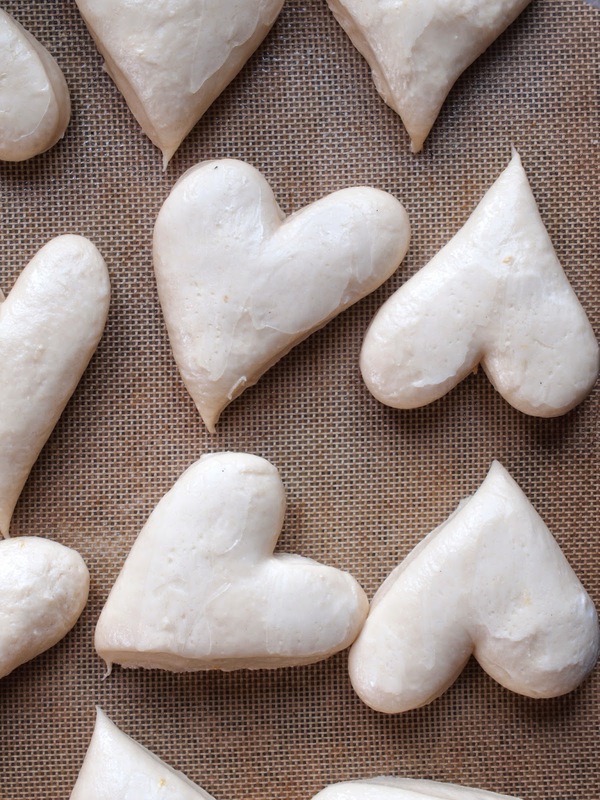 Take the hearts from the fridge, leaving them covered, and place in a warm area of your kitchen to proof. They should puff to almost double their size but not quite. While they are proofing, heat the oil in a large pan to 350ºF. Fry off 2-3 donuts at a time but not more otherwise the temperature of the oil will drop too drastically. Fry on one side for 1 to 1 1/2 minutes and then flip (I use chopsticks to flip) and fry for 1 - 1 1/2 minutes more. Transfer to a cooling rack. Continue frying until all your donuts are cooked and allow to cool completely, about 20 minutes. Transfer the filling to a large pastry bag fitted with a medium/small open tip. Using a wooden skewer or chopstick, poke a hole in the side of each donut and insert the tip of the pastry bag as close to the center of the donut as you can. Squirt about 2-3 tablespoons of filling (as much as you can without an explosion) into the donut. 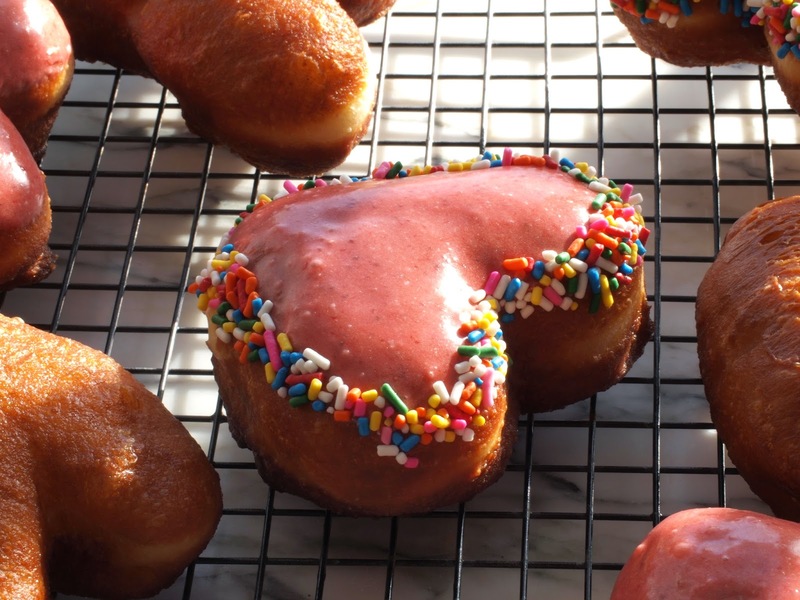 Dip the top of each donut in the strawberry glaze and, if using, decorate with sprinkles. Serve immediately.